As the summer months quickly approach, so too does the busy season for inflatable rentals. It is important for the protection of guests, and your business, that you have procedures in place in case of an emergency. When operating your inflatable there are a number of factors that can affect the product and its performance that are out of your control. You need to have a plan of action in place in the event that there is a loss of power while operating your inflatable. In case of a power loss it is important to remain calm and clear headed. You should remove everyone from the inflatable as quickly, but orderly, as possible. If the power to the inflatable is suddenly lost, most inflatables will deflate slowly to the ground, allowing you time to get everyone out of the structure. If you are not able to get everyone out before the inflatable deflates remember not to panic. 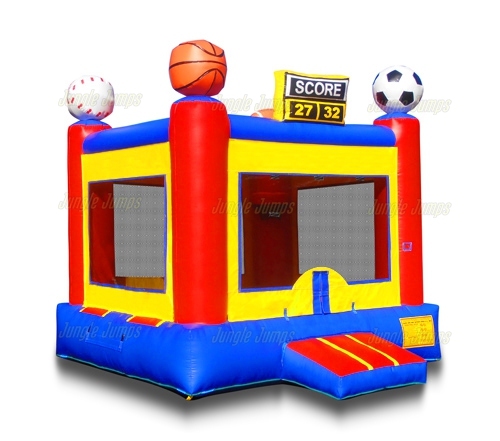 While it may be difficult to walk around and exit the structure, most inflatables have an opening on the roof that allows for plenty of ventilation. If the power to the inflatable suddenly stops, you should immediately check the blower. Make sure that this has not been switched off or pulled out of the power outlet. Another emergency situation for an outdoor inflatable are sudden strong winds. Winds can be very dangerous to inflatables and the people inside them. The general rule of thumb for inflatables is that they should be deflated in winds exceeding 25 mph. This can be difficult to estimate on a whim. If you see large tree branches swaying in the wind, the telephone wires are creating a whistling noise, or an umbrella can be used only with difficulty you can assume that it is unsafe to operate an inflatable. You should have everyone exit the inflatable and immediately turn the power to the blower off. Rain can be another emergency situation for operating an inflatable. It is not advisable to use an inflatable in any type of rainy situation. The wet vinyl can be slippery for those inside the inflatable, providing a dangerous situation. If the rain is light you can certainly leave the inflatable up. The air pressure will prevent too much water from entering the base of the unit. If the rain looks to be heavy or long lasting you should turn the power off and remove the blower from the unit, moving the blower indoors. It is advisable to also untie the sandbags or stakes from one side of the inflatable and fold it in half. This will prevent an abundance of water from getting into the unit. If you have an extra tarp you may also want to cover the deflated inflatable. Knowing how to deal with emergency situations should they arise will make it easy to keep your events accident-free and your products from enduring any damage. Good luck and happy renting. It is important for the protection of guests, and your business, that you have procedures in place in case of an emergency. When operating your inflatable there are a number of factors that can affect the product and its performance that are out of your control.